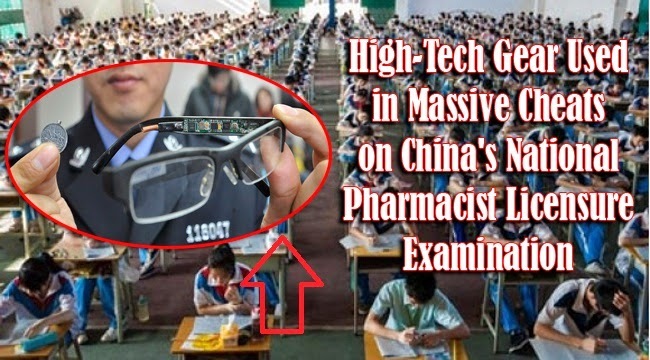 A massive cheating coup involving 2,440 Chinese students had been caught during a national pharmacist licensure examination. The students involved had been discovered to use a high tech cheating paraphernalia. Held in seven testing sites in Xi’an City, about 25,000 aspiring pharmacists flocked the testing centers on October 18-19. As reported, Shaanxi Radio Monitoring Station was able to detect an abnormal radio signal that is believed to be used by the students to cheat. The 2440 students were asked out for investigation and as it turned out, they were using wireless earphone and erasers to get answers from a source. According to one of them named Yao, he had observed that almost half of the test takers in the room are using a wireless.as for the electronic erasers, it had a small screen that can show the answer. Each student who was involved in the large scale cheating paid $330. As shard by Director of Test Operation Department, Du Fangshuai, the test takers would have they scores forfeited and they will be ban from taking the licensure tests for the next two years. It was ten minutes after the actual test begun that the answers came in. There are people who had been sent to take the test quickly and left after memorizing the questions, then they sent the answers through a radio frequency. China has a new law called Good Supply Practice (GSP) that requires a licensed pharmacist in every pharmacy stores. Owners of the shops were given until 2015 to have a professional pharmacist in their store or they will not be considered legal.